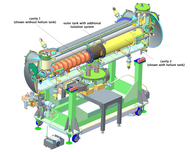 As the production of two superconducting accelerator modules for the future electron accelerator MESA ("Mainz Energy-Recovering Superconducting Accelerator") at the Johannes Gutenberg University Mainz (JGU) gets on its way, the MESA project launches into its next phase. MESA is based on a unique concept for recovering a part of the energy that is required for accelerating the electron beam. "The operating costs of MESA can therefore be reduced significantly", says Professor Kurt Aulenbacher, head of the project team. MESA is the central instrument for several key experiments at the Cluster of Excellence PRISMA ("Precision Physics, Fundamental Interactions and Structure of Matter"). These include precision measurements of the proton radius and the search for so-called dark photons, particles that may explain the mystery of dark matter. At the end of May, for the first time the entire project team for producing the superconducting accelerator modules met on site. The team, which includes engineers, physicists and production specialists of both the Institute of Nuclear Physics at JGU and the manufacturing company Research Instruments, discussed technical details and fixed the production schedule for the modules, each of which will measure nearly four metres in length. These modules are highly complex technical components of modern linear accelerators, which use electromagnetic alternating fields to bring elementary particles — in the case of MESA, electrons — close to the speed of light. The MESA modules are superconducting and therefore have to be kept at a temperature of -271,3 degrees Celsius, close to absolute zero. They consist of a system for thermal insulation (a ‘cryostat’) with built-in superconducting resonators, so-called cavities. These cavities are made of niobium, a metal that turns superconducting at very low temperatures. To ensure that the required operating temperature of -271.3 degrees Celsius is maintained, the cavities are welded into a tank that is flushed with liquid helium. The helium tank with the cavities inside is, in turn, enclosed in another tank, similar to a thermos. For additional isolation, liquid nitrogen is passed through a system of pipes arranged between helium and outer tank. MESA will be the world's first superconducting energy-recovering accelerator dedicated to research. "With the high intensity and quality of its beam, MESA provides a unique platform for a forward-looking experimental programme to study and test the limits of currently known phenomena in elementary particle physics; this is one of the core objectives of PRISMA", says Professor Hartmut Wittig, spokesperson for the Cluster of Excellence, from whose resources the development and construction of MESA is funded. Cross-section through the highly complex accelerator module with its thermal-insulation system and the superconducting resonators (cavities). Schematics of the MESA accelerator. The green cylinders represent the two accelerator modules. After two full rounds of recirculation, the electron beam reaches an energy of 150 MeV.